S.A.W. is an ultra-concentrated pre-workout formula for professionals. The supplement has powerful anabolic properties and significantly increases the volume of exercising muscles. S.A.W. provides them an extra supply of oxygen, nutrients and strong impulse to growth. The unique complex of beta-alanine and active neurostimulants improves endurance and concentration, and increases the body's energy reserves. The formula helps prevent premature fatigue and excessive acidification of tissues. S.A.W. 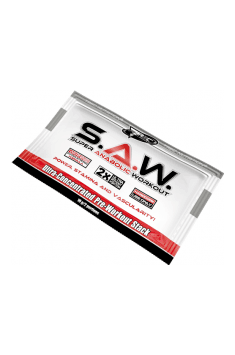 helps build muscle power and mass, as well as improving efficiency during strenuous exercise. Want to improve your training results? Wondering how to achieve them? Tried everything and still not getting the desired results? Your training seems like an uneven fight against your own weaknesses? Can’t concentrate, while your muscles are burning? Each movement makes you “howl with pain"? Tried various pre-training stacks, but left wondering why they don’t work as it “says in the ad"? The powder concealed in a large, colourful tin hasn’t helped you build power and extra muscle mass as you hoped it would? The mysterious mixture of exotic herbs and pseudo-innovative carbohydrates isn’t working and makes you feel strange and gain fat? You need SUPER ANABOLIC SUPPORT! TREAT SPORT LIKE A PROFESSIONAL! If you take your sport seriously, you should approach supplements in the same way. Professional training requires professional products! Whether you are a bodybuilder, a fighter or a strongman, your muscles need the same components to keep generating power and energy! Only tested and safe substances will help you achieve success in every sports discipline. Don’t experiment on your body by taking complex and not always safe combinations of poorly known and untested ingredients. Leave experiments to scientists! Looking for a good pre-training product? Check how many active ingredients it really has, since they'll help you improve your exercise capacity. Don’t pay for unnecessary fillers and “advanced" systems transporting creatine or amino acids, that in reality turn out to be just simple sugars! Remember! It’s the degree of concentration of the product and the correct selection of active ingredients at the right doses, and not the size of the packaging, that translate into a final effect of supplementation. Want your muscles to be larger and more powerful, while your movements faster, stronger and more precise? Wish to face up to your weaknesses and maximise your body’s potential? Try S.A.W. - the most powerful pre-training stack ever produced by the TREC NUTRITION laboratories. Sharpen your senses! Feel an incredible flow of energy, and open yourself to a brand new training experience. Now your brain will gain full control over your muscles! Take your exercise to the highest intensity level you haven’t even considered before. Transform ordinary training into a SUPER ANABOLIC WORKOUT! S.A.W. is a formula combining only tested, safe and effective active ingredients that will help you conquer exercise stagnation from the first use. The exceptionally high concentration of active ingredients gives a whole new dimension to pre-training supplementation. S.A.W. is a pure essence of support - the product is free from unnecessary sugars, additives and fillers. The incredibly high degree of concentration (almost 96% of the product are active substances) and the highest quality raw materials mean that each 5g measure of the preparation holds a huge anabolic and ergogenic potential. The synergistic action of the ingredients dramatically increases the body’s ability to work under a heavy load. Not only are you able to train harder and longer, but your efforts bring also far better results. The product’s formula, activating the main anabolic pathways, will help you quickly build high quality muscles ready to work under a heavy load, with no risk of excessive fat accumulation. This is a special recipe of ingredients maximising the production of energy during intensive and prolonged exercise. The high dose of beta-alanine prevents early muscle fatigue, and reduces acidification. The carnosine formed as a result acts as a natural buffer which helps maintain optimal metabolic conditions for intensive work in cells. It results in reduced post-training muscle aches, while intensive muscle contractions are no longer accompanied by a “burning" sensation. The energy matrix has also been supplemented by well-studied active neurostimulators. The ingredients stimulate the nervous system and improve concentration, helping the brain achieve full control over muscle activity. Taurine and L-tyrosine are precursors of neurotransmitters, which accelerate the transmission of nerve impulses and delay fatigue. Caffeine enhances the metabolism and improves the function of the central nervous system. This stimulates the body to intensive work and enhances the production of energy, while naringenin helps maintain this effect for longer. Bouts of intensive exercise cause a rapid increase in intensity of metabolism in muscle cells. In order to keep up with transporting energy essential for muscle contractions, huge amounts of ATP (adenosine triphosphate) are required. Creatine is essential for regenerating this essential cellular fuel. S.A.W. contains an effective formula of synergistic forms of creatine - monohydrate, malate, and ethyl ester. The combination of the three different forms of this substance optimises its transport and absorption. Muscles are better supplied with creatine, while ATP supplies are regenerated faster. This improves the power and speed of muscle fibre contractions, which directly helps increase the levels of exercise load. S.A.W. is a universal formula recommended for professional athletes, especially during exceptionally high intensity of exercise or training stagnation. S.A.W. is a powerful and effective formula whose exceptional energising effects will be felt right from the first dose. Regular supplementation helps build increased pure muscle mass and obtain significant improvements in training results, in particular in disciplines requiring high levels of power and strength endurance. The product is recommended prior to exercise for bodybuilders, fighters, weightlifters, triathletes, and other power athletes. Jak najbardziej polecam, pompa na treningu gwarantowana. Polecam,daje sile,koncentruje i jest pompa na treningu.Zaczynac od jednej miarki! Use the preparation 30 minutes before planned training. It is recommended to test your sensitivity to the supplement’s effects. Its use should be started from 5g (half a sachet) and if necessary increased to 10g (the whole sachet). Take the supplement 30 minutes before planned physical activity. Do not exceed the portion of 10 g of the preparation a day. Avoid combining with other products containing caffeine. The product has strong stimulating effect, do not use before sleep. Aromas, acidity regulator (malic acid and citric acid), silicon dioxide (anti-caking substance), sweetener- sucralose. Supplement supporting healthy joints. It shows anti-inflammatory, painkilling and anti-swelling properties. Dietary supplement increasing testosterone while lowering estrogen level. Naringenin (5,7,4'-Trihydroxyflavanone) is derived of flavone, found in grapefruit (Citrus paradisi) giving their to bitter taste. It is a very potent anti-oxidant, lowers cholesterol, improves blood supply to the tissue, useful for reducing body fat. It has properties of lowering the risk of developing cancer. By blocking the receptors, 11 beta-HSD, lowers cortisol levels. It is a component of herbal products supporting the endocrine system. In supplementation, used are: its thermogenic potential and increasing the effectiveness of other substances (e.g. Caffeine), in the form of pro-health supplements, vitaminizing, herbal products.